As part of our ongoing commitment to create, to share and to inspire, we are happy to present Flowers With Feeling, Inc.’s ‘Event Spotlight’. Today’s spotlight shines on a recent garden wedding at one of Chicago’s premier wedding and special event venues, Galleria Marchetti (featured on Bravo TV’s Top Chef Chicago – “Wedding Wars” ). 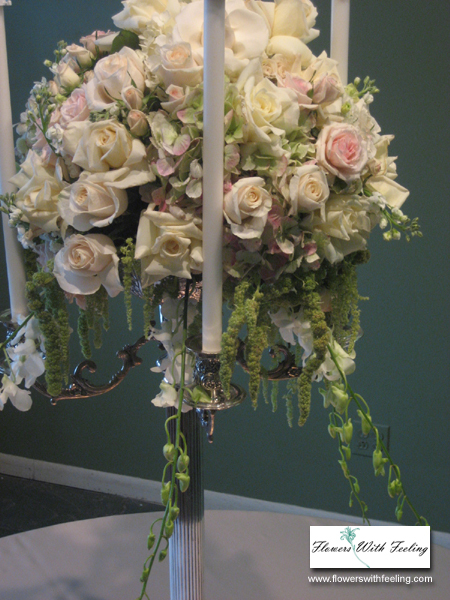 Floral décor was designed and created by Flowers With Feeling, Inc. Chicago. Nestled among flowering trees and seasonal blooms in this Tuscan inspired landscape, the Pavilion and the East Courtyard at Galleria Marchetti offered a magical setting for today’s featured wedding reception. This unique oasis in the city presented an ideal canvas for inspired floral centerpieces and décor. Floral centerpieces were created in an elegant high / low pave’ style using minimal foliage designed in a compact spherical form incorporating romantic soft white, ivory and champagne colored flowers including large open Virginia roses, champagne spray roses, large white Hydrangea, soft green Hydrangea, white stock flower, and white Hawaiian Orchids finished with cascading green Amaranthus. Elevated centerpieces are displayed atop sterling silver four arm illuminated candelabras completed with scattered Virginia rose petals and flickering candlelight at the base. 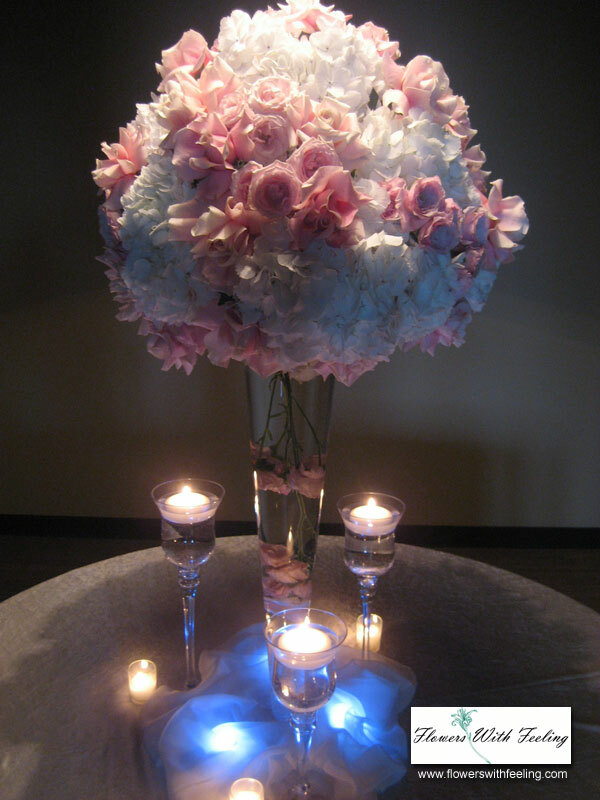 Low centerpieces are created in a coordinating fashion and displayed in the exclusive low ‘Marano’ candle stand. The head table centerpiece consists of various components with a dramatic coordinating compact long and low centerpiece as the focal point. Bride’s and bridesmaids’ bouquets were also placed in pre-positioned vases spaced strategically throughout the head table following the ceremony for added enhancement. Watch the video below to see these wedding flower designs, created by Flowers With Feeling, Inc., on location at Galleria Marchetti Chicago.